A few Monday mornings ago, I cycled through the Bosque. As I pedaled past cottonwoods with their first yellow leaves, I thought about stories to pitch my editor and food blurbs to write for the Gourmet website. I do a lot of brainstorming while riding or running. Little did I know I had no more need of thinking about such things. I returned home to the news that Gourmet was gone. But this is what I thought about along that ride: pumpkins. 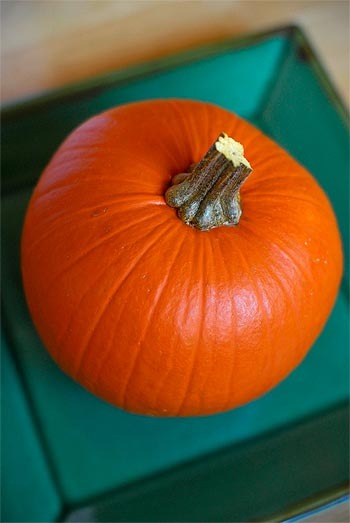 Halloween and pumpkin pie, yes, but also all the ways pumpkins are used and consumed in Asia—pumpkin curry, pumpkin soup, stir-fried pumpkin with herbs and spices. I thought of the little vegetarian restaurant in Chiang Mai, where we frequently ate a lunch of pumpkin with white pepper and bitter greens. It was an enticing balance of sweet-bitter-salty-spicy. 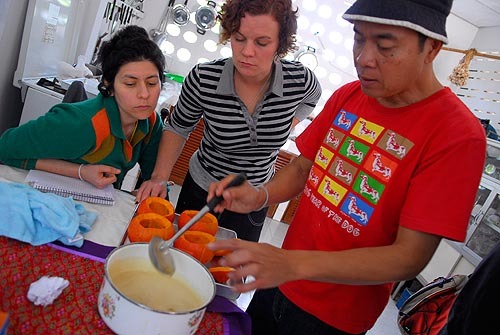 And I thought of the wonderful pumpkin custard we made with Sunny Chailert and Andy Ricker on their tour of northern Thailand, almost exactly one year ago. These were pert little softball-sized pumpkins, deeply colored, almost a rich as blood orange. We stuffed them with golden custard, then steamed them over a charcoal grill. I’m not normally big on custard, but this one I loved. 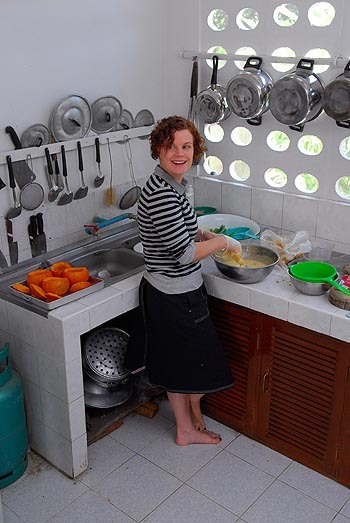 We began, barefoot, in a bright white kitchen in Sunny’s village, just outside of Chiang Mai. One of us sliced the tops off the pumpkins and scooped out the insides, while another cracked 10 little duck eggs into a bowl. Their yolks were as bright as the pumpkins. Sunny ripped apart pandanus leaves and tossed them into the eggs, then added 1 1/2 teaspoons of sea salt, a heaping tablespoon of rice flour and 1 1/2 cups of palm sugar chopped from a block. “A lot of people say, ‘Oh, just use brown sugar,’ but it’s really not the same,” Andy said. Real, pure palm sugar is key; it should be soft at room temperature. Next, the fun part: mixing the whole mess by hand. 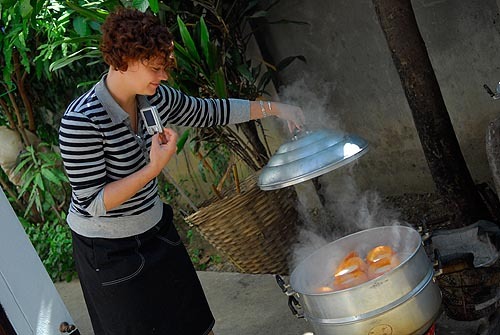 The goal: to infuse the custard with that aromatic essence of pandanus. “This is kind of a messy way of doing it,” Andy said. “A lot of people cheat by using pandanus extract, but you don’t get the same flavor.” (The leaves are not eaten.) Then Sunny added a big glug of coconut cream to the mix (this is usually done earlier but, oops, it didn’t happen that way). He poured the custard straight into the hollowed-out pumpkins, leaving about half an inch at the top, as the custard would expand. But it did. Everything smelled of pandanus—the air, the custard. And when all was done and cool, we ate our way through the thick, rich custard coupled with the slightly earthy but sweet pumpkin flesh. Seems to me this could make a fine alternative to Thanksgiving pumpkin pie. Sounds awesome! But…can one obtain pandanus leaves and palm sugar in ABQ? Yes on both counts. As is often the case in the US, the leaves are frozen. How many pandan leaves do you think for, say 4 mini pumpkins? I’ve got a lot of it growing and want to make better use of it. This sounds like something different for Thanksgiving. Claudia, I tend to think you’ll never have too much pandanus. We used a big clump for the whole batch of pumpkins. I’d say 3? 4? leaves for your 4 minis. But if you have an abundance of leaves and you like the flavor, feel free to use more. Xander, thank you. We are in NM after a beautiful week in Montana. Heading to Bosque del Apache this morning for a bike ride among migrating birds. Not sure I can get my hands on longan wood, but I’m definitely going to pick up some pandan leaves next time I’m at the 99 Ranch. My Singaporean relatives are going to faint over this recipe. Jess, glad you like the looks of the recipe. Hope your family does, too! 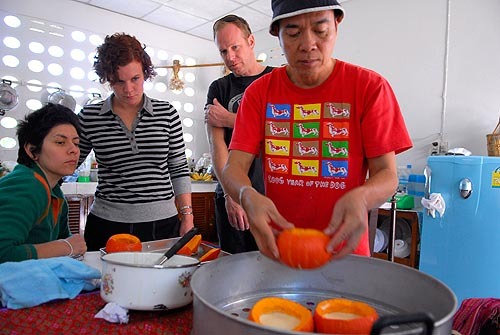 I am going to chiang mai in May to inspire myself in thai cooking. I am a chef from Tel Aviv and i will like to contact Mr Sunny Chailert …could you give me details on this amazing man.